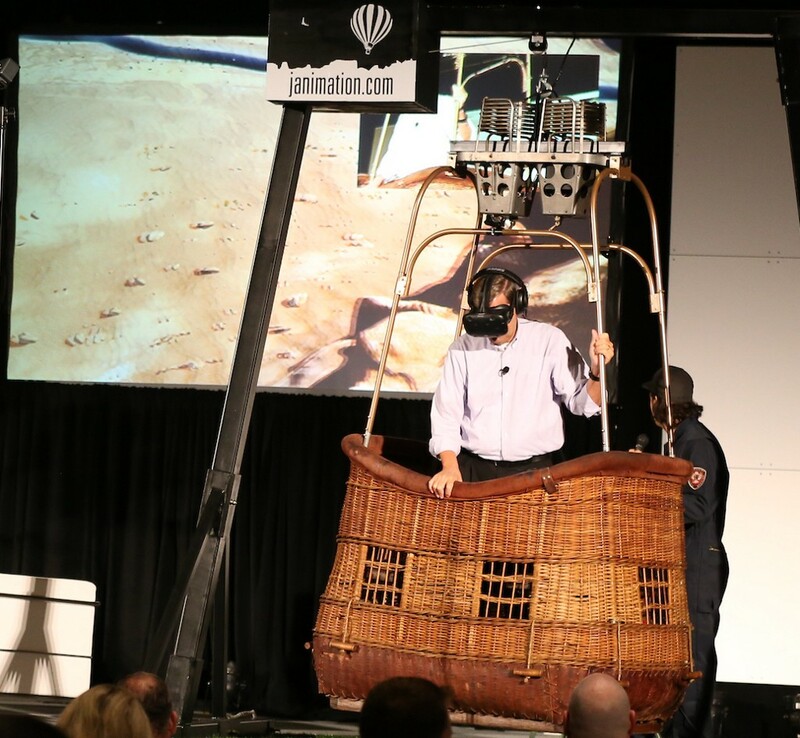 A participant from the audience pulled virtual reality goggles over his head, fitted headphones into place and let out a surprised “Holy S — -” as the wicker hot air balloon basket he stood in lifted a few inches off the ground. This is mixed reality– virtual reality mixed in with elements of the physical world– in this case, a hot air balloon basket, heat that simulates the flames used to raise the balloon and a slight breeze. To the participants, it felt like they were flying over canyons in bright hot air balloon. In October 2017, Odyssey presented a session at TTIA (Texas Travel Industry Association) Summit 2017 covering “Bright New Shiny Marketing” topics. A cornerstone and feature of this event was a live on-stage demonstration of mixed reality, using real hot air balloon components integrated with a digital virtual reality simulation. Odyssey, in partnership with its sister agency The Atkins Group, has launched an exclusive partnership with Janimation, a leader in animation, CGI and virtual reality. This partnership brings virtual and mixed reality experiences to the tourism and hospitality industry. The partnership focuses on developing portable mixed reality experiences that integrate all four of the human senses: sight, sound, taste and touch. The presentation covered different aspects of emerging virtual technology, including augmented reality, virtual reality and mixed reality. Augmented Reality — Monumentally Different than VR — Augmented Reality is often bucketed together with Virtual Reality, but the two are significantly different. 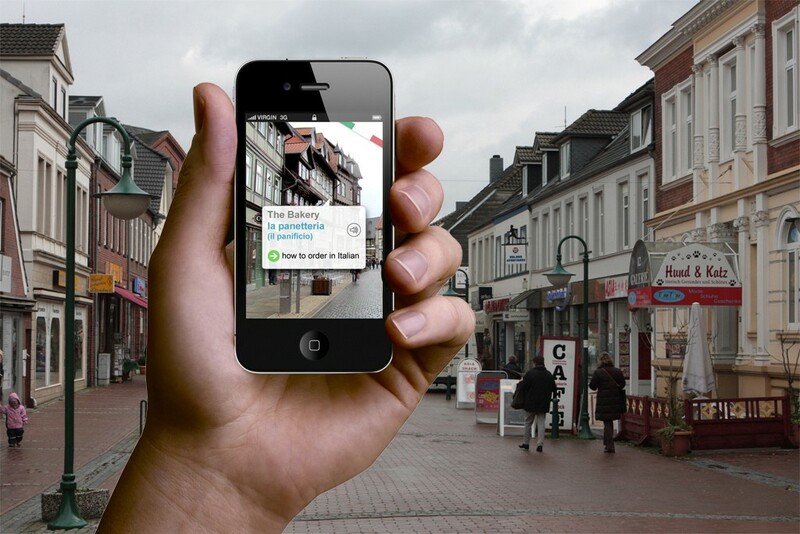 Augmented Reality simply augments or “adds to” a real life experience. Perhaps the most well known instance of augmented reality is Pokémon Go, a gaming app which makes digital creatures appear in the real world through users’ phones. Common and growing uses of augmented reality include: digital tour guides, historical comparisons showing old vs. new and augmented map and directional information. Virtual Reality — Not Yet Mainstream — Virtual Reality (VR) is transformative. Digital worlds appear through 3D goggles, and an audio headset completes the experience, dipping users into the ocean, hurtling them through space or taking them to completely new, imagined vistas. While VR is a hot and growing market, it’s not ready for mainstream consumption for a simple reason — VR headsets aren’t common in most households. The evolution of gaming consoles like Microsoft’s Xbox and Sony’s Playstation will create the tipping point, putting VR enabled devices in homes in 2018–2019. Until then, consumer VR experiences will be limited. Mixed Reality — The Deepest Experience — Mixed Reality (MR) creates the deepest opportunity for an immersive experience. Mixed reality combines physical elements (in the example shown, an authentic hot air balloon basket and heat and wind combined with a virtual environment). Users feel “like they’re there”. Mixed Reality solutions will begin to emerge in trade shows, traveling events and as part of attractions. Visit MakeStoriesHuman.com to learn more about Odyssey’s literary and cinematic storytelling services and products, including augmented reality, virtual reality and mixed reality experiences. 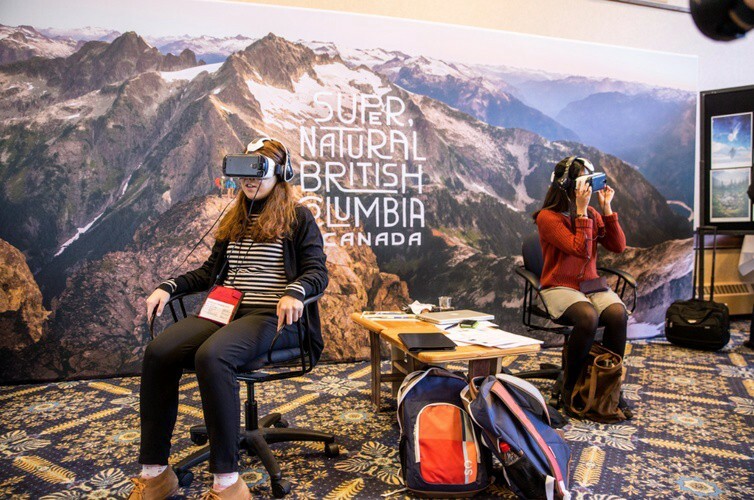 Virtual Reality for Tourism & Destination Marketing was originally published in makestorieshuman on Medium, where people are continuing the conversation by highlighting and responding to this story.